During a radical surgery to treat a rare bone cancer, surgeons at UC San Diego Health System and Moores Cancer Center removed 50 percent of a patient’s pelvis. Instead of amputating the connected leg, the surgical team, comprised of orthopaedic, vascular and urologic experts, saved the entire limb. 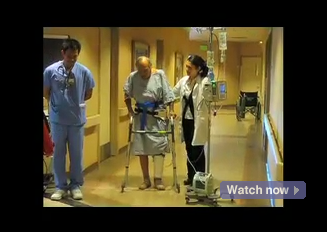 The patient was able to walk with assistance five weeks after surgery. Ortiz was diagnosed with a form of cancer called chondrosarcoma, the second most common bone malignancy affecting older adults. This cancer is not responsive to chemotherapy or radiation. Surgery is the only treatment option, which, in 90 percent of cases, results in a disfiguring loss of the leg and part of the hip. During the operation to remove half the pelvis, the team freed the tumor and salvaged the leg. The growth was embedded in the pelvic bone, nerves and blood vessels and adjacent to critical structures such as the bladder, bowel and prostate. The surgeons disconnected the massive growth from its blood supply without disrupting critical blood flow to the buttock and leg. The leg muscle was then reconstructed and attached to the abdominal musculature. Over time, a combination of scarring and new muscle will hold the leg bone in place. The surgical team included Kulidjian, Nikhil Kansal, MD, Scott Meyer, MD, and Christopher Kane, MD. The Department of Orthopaedic Surgery at UC San Diego Health Systemis dedicated to providing excellence in clinical care and research in cartilage restoration and transplantation, joint replacement, foot and ankle, hand and upper extremity surgery, acute or subacute trauma care, and spine and cancer surgery.